Estonia e-resident share capital: Use Holvi. Save time. Be free. E-residents can now pay share capital through any credit or payment institution in the EEA, including Holvi. This is a guest post submitted by a company that’s growing by serving e-residents. Learn more about working in partnership with the e-Residency programme here. Starting a business as an e-resident of Estonia has always been straightforward. Except for one thing. When you open a limited liability company, you have to pay share capital. And in order to do this, you need to open an Estonian bank account. Which means taking time away from your business, collecting a bunch of paperwork and waiting around in a grey office for an account-opening executive to see you. Sounds like a drag? That’s because it is. Well, was. As from January 2019, you don’t have to go through that hassle anymore. In December 2018, the Riigikogu — the Estonian Parliament — passed a law amending the Estonian Commercial Code. As a result of the amendment, you can pay your share capital through any credit or payment institution in the European Economic Area, including Holvi. 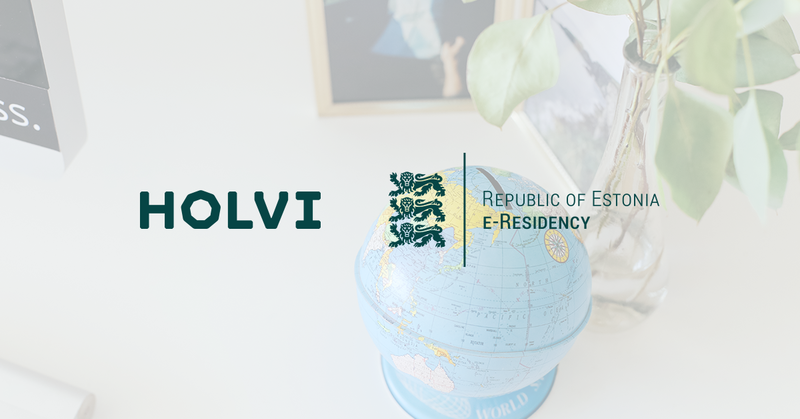 If you’re an e-resident of Estonia and a Holvi customer, your business is now truly free. Not only can you access the EU single market’s 500 million customers and manage your money entirely online. You can also pay your company’s share capital at the touch of a button. Painting the picture: what was the situation before January 2019? When you open a limited liability company as an Estonian e-resident, you have to register at least €2,500 in share capital. This is called ‘minimum share capital’ or ‘minimum capital requirement’. The share capital contribution isn’t a fee. It’s money you give your company to spend on building and growing your business. Then, when your company starts doing well, you can take the profits as dividends. Before January 2019, you could only register share capital through an Estonian bank. And this meant that you’d have had to go through the bureaucratic and time-consuming process of opening a traditional Estonian bank account. How has the law changed? The amendment of the law allows you to pay your share capital using any bank or payment institution in the EEA, which includes the 28 member states of the European Union plus Norway, Iceland and Liechtenstein. If you already have a business bank account in an EEA country, this is great news. It means you can use your current business bank account to pay in your share capital. There’s no need to open a separate one in Estonia. It’s never been easier to do work you love and live your dream lifestyle. But while technology has made us more flexible and more mobile, the business side of things has failed to keep up. We’d know. When we started Holvi in 2011, it was out of frustration. Even basic things like tracking expenses and opening a business bank account were complicated processes. So we decided to build the business bank account we wished we had. Over the past 2 and a half years, we’ve helped thousands of e-residents from all over the world become successful entrepreneurs. But with this amendment of the law, we think e-residents of Estonia are even freer to live their best life. Including picking the business account that best suits their needs, whether that’s in Estonia or somewhere else in the EEA. Thinking of joining Estonia’s over 50 000 e-residents and launching a business? At Holvi, we’re more than a business bank account for entrepreneurs. Find out why we’re the perfect business partner for Estonian e-Residents. Mika Setälä is VP of Business Development at Holvi and he continuously works to make borderless banking easy for e-residents.